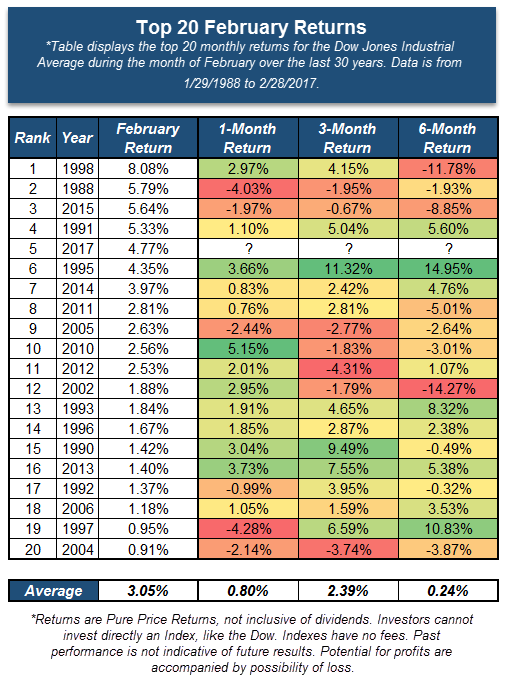 1.March Madness…Highest Monthly Return Month for 10 Years. March is known for many things, from spring training, to the NCAA tournament, to spring flowers, to consistent equity gains? 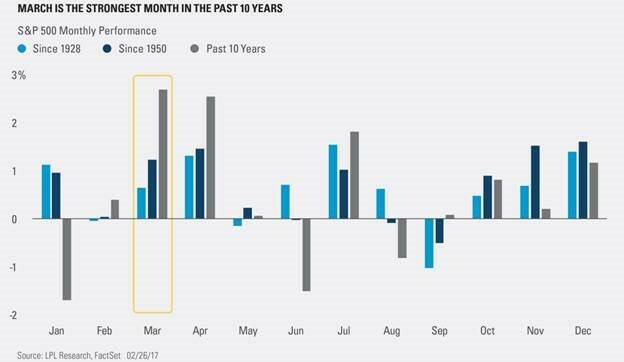 That’s right, over the past 10 years, there hasn’t been a month for the S&P 500 with a higher average monthly return than March. With Wednesday’s action, the Dow Jones Industrial Average DJIA rallied above the $21,000 level for the first time ever. Although this is a very noteworthy occurrence it would have not occurred this soon if it were not for the positive return for the Index that we saw during February. With the close on February 28th, the Dow gained 4.77% for the month, which is the 5th best February return in the last 30 years. February 1998 holds the top spot on our list as the Dow gained 8.08%, followed by 1988 in which the Dow gained 5.79%. The only year during this decade that betters the 2017 February return is 2015, when DJIA gained 5.64%. Interestingly enough, eight years from the list occurred during the 1990s and the average return for February during those eight years was 3.13%. For perspective on how the Dow traded after these February dates we looked 1, 3, and 6 months following the February of the particular year. Altogether, the results were somewhat mixed, but on average we do see that the market moves higher in the 1, 3, and 6 months following. On average, the 3-months following these February dates offers the best return, so keep an eye out on the how the market moves following this May. 3. Has Europe Bottomed? Fund Flows Lagging Market and Economic Data. The Eurozone: This chart shows European fund flows lagging the economic surprise index due to political risks. Will things normalize after the elections across major European economies? 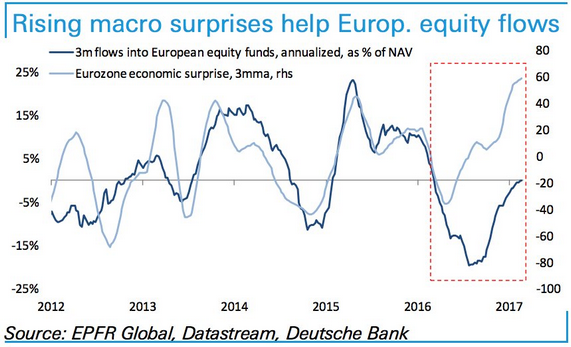 A bull case for European stocks? 4.Ten Year Treasury Yield Up Over 100% From 2016 Lows. At 1:30 p.m. ET, the yield on the benchmark 10-year note reached 2.5%. It briefly touched that level on February 15 and got very close on February 3, before falling back each time. Thomas Byrne of Wealth Strategies & Management notes that lately, buyers rush in whenever the 10-year yield reaches the 2.5% level. 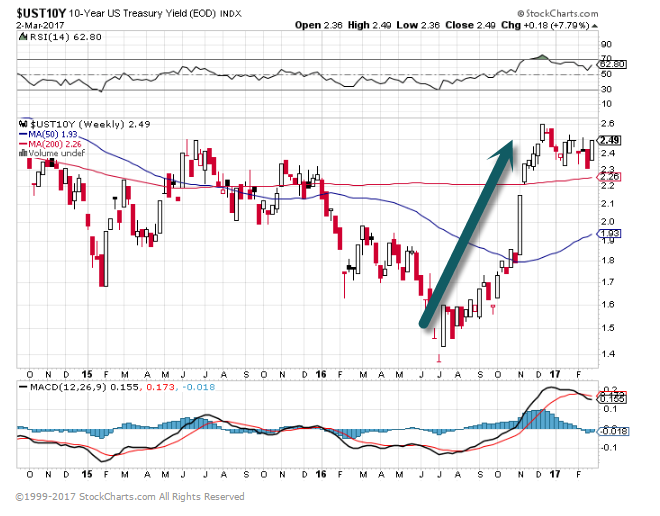 U.S. Treasury yields are still far more attractive than foreign debt. He believes demand for safe yields from baby boomers, insurance companies and pension funds will keep a lid on rates. The 10-year yield is flirting with the top of its range, even as wages, inflation and now oil prices, remain tame. Let’s see of demand pours in if it gets above 2.50%. Traders might let it run and whipsaw investors somewhere between 2.55% and 2.60%. If it gets through 2.60%, 2.70% could be the next stop, but I believe money will flow in before that happened. 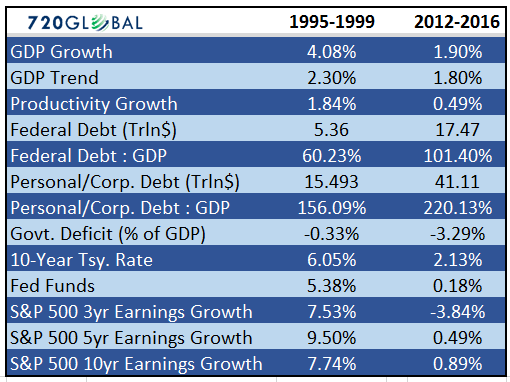 “Even though current valuation measures are not as extreme as in 1999, today’s economic underpinnings are not as robust as they were then,” he wrote. “Such perspective allows for a unique quantification, a comparison of valuations and economic activity, to show that today’s P/E ratio might be more overvalued than those observed in 1999. 6.Follow up to Yesterday’s Comments on Europe….Growth at 6 Year Highs. 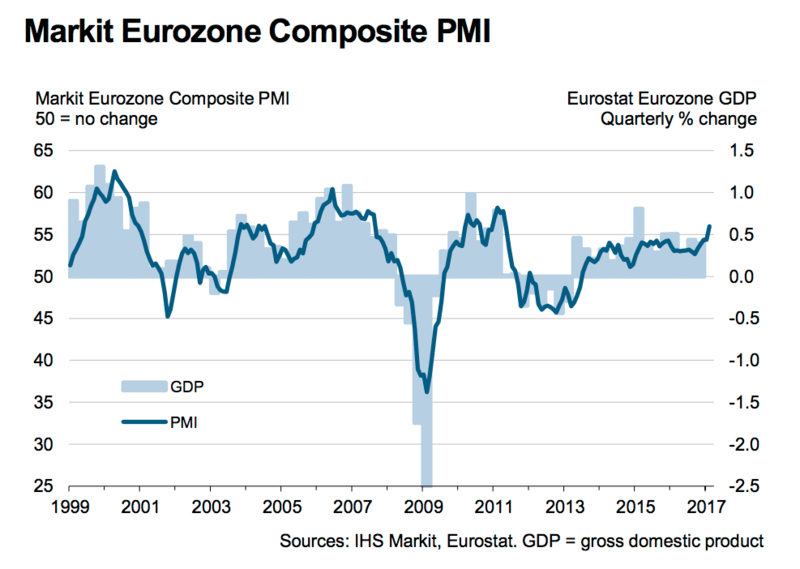 “Growth of eurozone economic output accelerated to a near six-year record in February,” IHS Markit said in a release. 7.With All The Headlines About New Highs and Trump Rally….Emerging Markets Outperforming YTD. 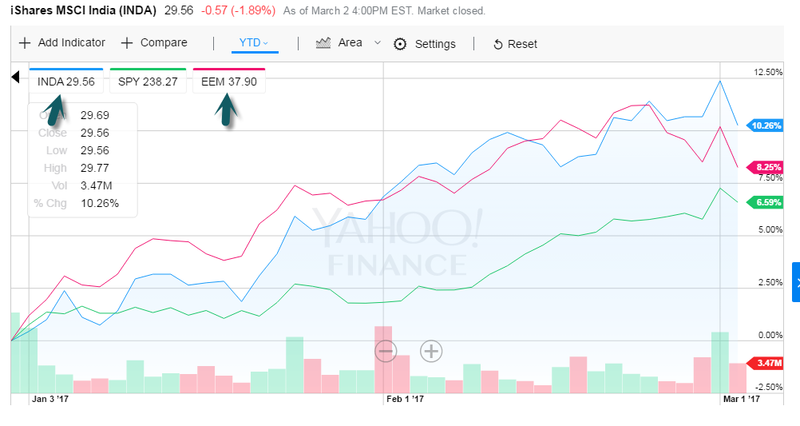 EEM Outperforming S&P….India Leading EEM Markets. 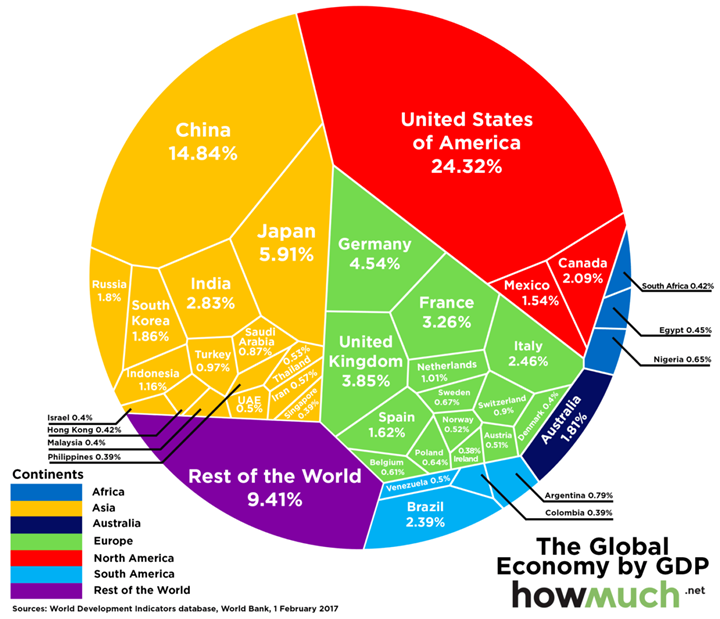 8.$74 Trillion Global Economy…The U.S. and China are Huge on GDP Map. Fascinating depiction of the global economy, broken down by geographic region. Each country’s is sized according to their percentage of global GDP output. (GDP data is via the World Bank, effective February 2017). South America is much smaller than I expected, as is China (still). Amazing that US is about the same size of Europe. 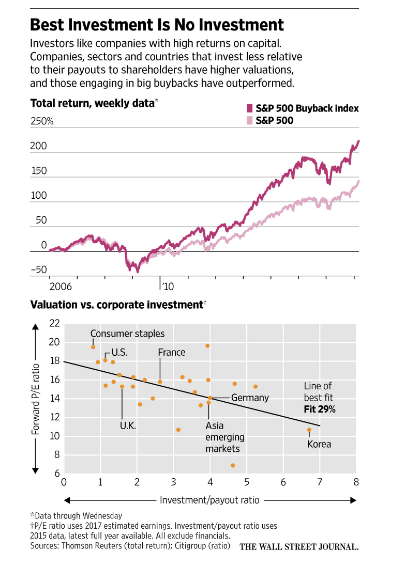 9.Read of the Day….Streetwise WSJ James Mackintosh on Buybacks. Are shortsighted managers underinvesting in the American economy because they want to line the pockets of investors through share buybacks? Yes, says the world’s biggest fund manager: American capitalism needs to be fixed. No, says the world’s most successful investor, good projects aren’t dying for lack of financing. Larry Fink, BlackRock Inc.’s chairman and chief executive, and Warren Buffett, Berkshire Hathaway Inc.’s chairman, personify a debate vital to investors and voters. If managers are ignoring profitable opportunities because of short-term shareholders or badly-designed incentives, a better approach could boost both share prices and economic growth. Bringing back corporate cash trapped overseas, part of the aim of Donald Trump’s tax plans, could then support further investment. If everything’s dandy with corporate management, the blame for slow growth lies elsewhere. Companies bringing cash home to the U.S. won’t have new projects to invest in, so it’s likely to be spent on yet more buybacks. Mr. Fink warned against the “furious pace” of buybacks in his annual letter to CEOs earlier this year. “We believe companies must balance those practices with investment in future growth,” he said. Mr. Buffett shot back last weekend in his letter to shareholders, saying companies and investors are “awash” in cash and constantly scouting for opportunities. “I’m not aware of any enticing project that in recent years has died for lack of capital,” he wrote. “Call us if you have a candidate.” In other words, capitalism and the market are doing their job of directing money to where it can best be used. The issue of buybacks is really a puzzle about stock valuations and profits. Profit margins are high and stocks are worth far more than it would cost to replace all corporate assets. Why living life in the fast lane can slow you down, and what to do instead. 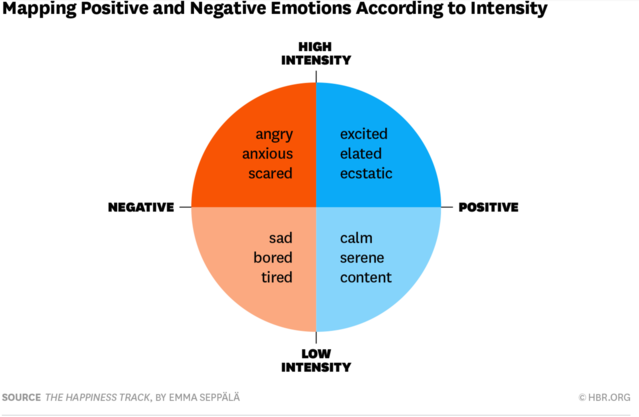 It’s easy to see how high-intensity negative emotions might wear us out during the course of the day — and not just frustration and anger. Many of us have come to rely on our stress response to get things done. We fuel ourselves up with adrenaline and caffeine, over-scheduling ourselves and waiting until the very last minute to complete projects, waiting for that “fight or flight” mode to kick in and believing we need a certain amount of stress to be productive. 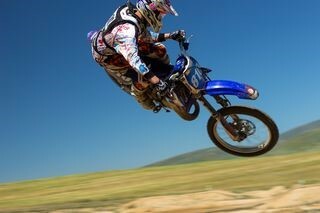 The problem, however, is that high-intensity emotions are physiologically taxing. Excitement, even when it is fun, involves what psychologists call “physiological arousal” — activation of our sympathetic (fight-or-flight) system. High-intensity positive emotions involve some of the same physiological responses as high-intensity negative emotions like anxiety or anger. Our heart rate increases, our sweat glands activate, and we startle easily. Because it activates the body’s stress response, excitement can deplete our system when sustained over longer periods — chronic stress compromises our immunity, memory, and attention span. In other words, high intensity — whether it’s from negative states like anxiety or positive states like excitement — taxes the body.